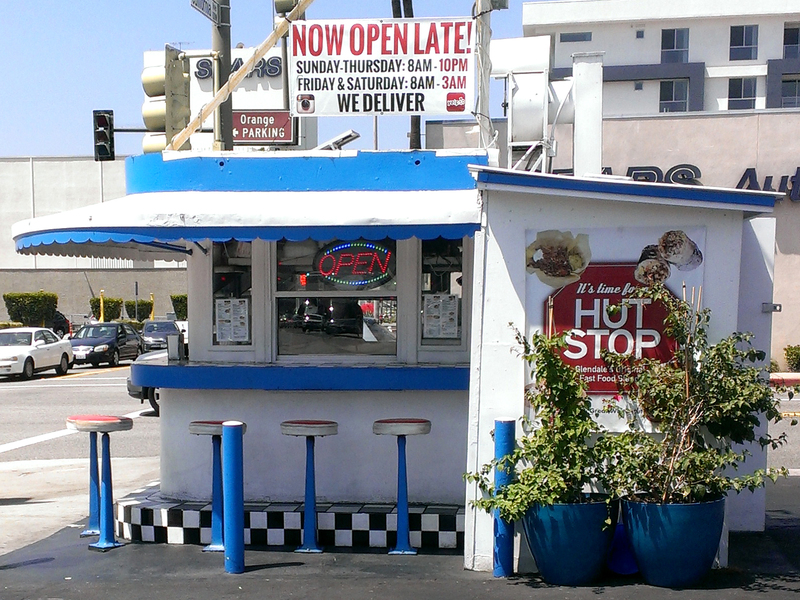 (1947) The Great White Hut, Glendale | Remains of L.A.
-A tiny little building in the corner of a parking lot, white walls with bright blue trim, surrounded on three sides with a black-and-white checker-board tile counter. Stools with blue posts and red seats, shaded by a blue-and-white awning. We order through a little window. The inside looks a little cramped but very organized; like no space is wasted. -I got a burger with fries; both very good but the fries in particular were just what I always want fries to be. David (my husband) got the Carne Asada fries; I had one bite and they were delicious but a little spicy for me. -David (my husband) got a can of coke and it was one of those that have a name on the side, which is a thing I hate, but this one didn’t have a name it said “Adventurer” and I sheepishly thought that was kind of neat. -The girl inside asked David (my husband) if he wanted spicy or mild salsa, and when he chose spicy she encouraged him to also get the green salsa on the side because it was so good. I love when cooks/servers take a real interest in the food and what goes with it, and makes suggestions like that. -We had to decide where to sit; either with our backs to the parking lot or our backs to the street. We chose street, which I thought was a good choice because there was more to look at on that side. I kept wanting to whip around to see who was sneaking up behind me, but that would have been the case whichever side we chose. -When my burger came, it had special sauce on it; I looked at the menu taped to the window and saw that it says right there that the burger will have sauce. I just didn’t notice. Special sauce almost always has mayo in it and I’m allergic, so I had to send it back. I felt like such a jerk, but they were super nice about it. I put another dollar in the tip jar. -There were two people inside, and they seemed like great people. Cheerful and helpful and nice. The way we were sitting, we were watching them work. At one point the woman paused and stood with her face tilted up to the fan. It looked like a painting. -We were right next to a busy intersection and it was around lunch time, so there were a lot of people out. One woman walked by with a parasol. I always want to carry a parasol when I walk in the sun; I even own a parasol. Not a fancy one; it looks like a regular folding umbrella but the material has special spf properties. I always feel awkward, though, with a parasol. Like I’m not sure which hand to carry it in and then my purse gets in the way and I feel silly if I walk under shade, like I should fold it up until I’m back in the sun but that would be a huge pain, and then also I always wear a baseball cap when I’m outside because sun on my head gives me headaches so a hat and a parasol seems like such overkill but really sometimes a hat isn’t enough. I usually try it once and then feel weird and put the parasol away but then I see someone like this woman, looking so cool and also cool, you know, and I think I should get the parasol out again. I’m also not great with umbrellas. I always worry that it has actually stopped raining and I just haven’t noticed and look like a silly person. -Painted on one side of the Hut is a life-sized (or thereabouts) portrait of James Dean, and on the other side is a portrait of Marilyn Monroe. I really liked them, even though the feet sort of trail away and it’s a little disconcerting. But if you just look at them from the knees up, they’re terrific. -The counter was just a little too high for me to eat comfortably, but that’s very common with me and counters. I’m quite short. -The woman inside the hut came to the window in front of us, laughing that her eyes were stinging from the onion she’d just cut so she needed air. We exchanged tips we’d heard about how to keep onions from hurting our eyes, like chewing gum or cutting them under water. -A guy crossing the street made a big production of jumping dramatically out of the way when a car came and stopped at the intersection. The car wasn’t anywhere near him, seriously. It wasn’t over the line at all. 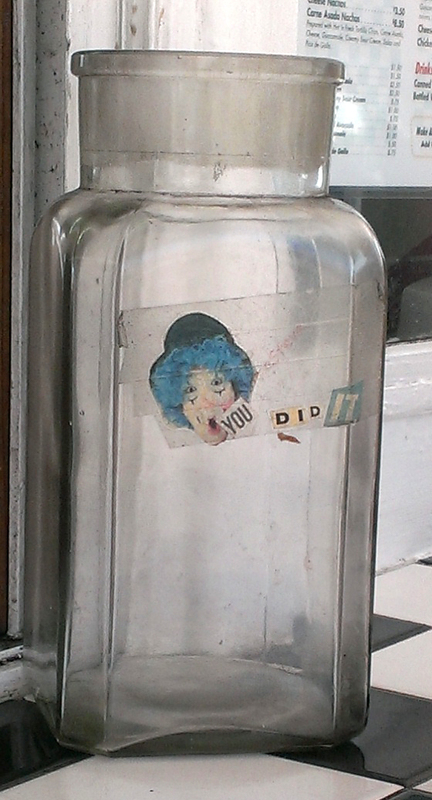 -Next to where we sat was another tip jar, this one had words taped to it–looking like they were cut out of a magazine–that said “you did it” and also a picture of a clown. The clown had make-up under it’s eyes that looked kind of like closed eyelids, so I kept thinking it’s eyes were closed and then I’d see its eyes. It was a strange effect, and got more pronounced when I pointed it out to my husband and he put his thumb over the eyes, then took it off again. It was like the clown was opening and closing its eyes. -It got busy towards the end, but at first it was just us and people getting food to take-away. A guy came to the order window who seemed to know both the people inside; he was wearing a t-shirt that said “valor” and he talked to them for a while, and kept asking if they thought his hair looked okay. I thought his hair looked really nice, but he didn’t ask me. He was talking to the woman inside about the kitten she’d recently adopted, but instead of “kitten” he kept saying “baby cat.” I am probably going to say that too, from now on. -A man in a suit was walking down the sidewalk towards us, silently, and then suddenly when he was right next to us he said, “oh, well,” loudly and startlingly. It turned out he was just on his phone, though, and I guess had been listening up till then. -There were security cameras all around the hut; where we were sitting we could see a screen inside with six different shots of the parking lot and sidewalk. I thought this was odd because if you wanted to see outside you could just look out the windows that were all around, but David (my husband) reminded me that security cameras record as well, which I guess I’d forgotten. -David (my husband) pointed out that the whole place felt like it should be a block from the beach. I hadn’t realized till he said it that I’d been waiting for some sort of saltwater breeze. It made me feel a little homesick for the ocean, but in a good way. What I Ate: Hamburger with tomato and lettuce, french fries, one bite of David (my husband)’s Carne Asada fries. What Sort of Ghost I’d Expect to Find if I Believed in Ghosts Which I do Not: Two women in smartly tailored business suits with matching hats, who came here every single day on their lunch breaks, to complain about their bosses and cheer themselves up by flirting gently with the cook.